We have created a full report containing a profile of all the listed traders generated during your search. This includes contact details of the trader and services offered. 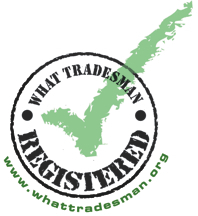 Please consider the information provided carefully and remember to always gain at least 3 written quotes from registered traders, comparing prices and standards of service. Download Contract Many problems with building work arise through the lack of understanding over the work to be done and the price to be paid. This simple standard contract is intended to give you some idea of the details that need to be checked and recorded before a working agreement is entered into. It is recommended this contract can be used when agreeing work with a trader from the Register.